TWIN BRIDGES – Twin Bridges school district pitched an educational program to the public on Thursday evening, January 24, that promises to prepare its students for the future – a future in which the jobs students now in school work at may not even exist. 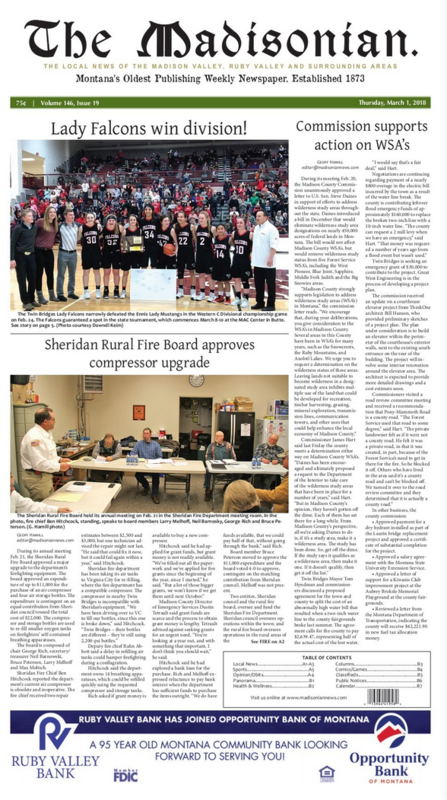 TWIN BRIDGES – A co-op eight-man football team between Twin Bridges and Sheridan school districts will become a reality, following a vote by the Twin Bridges school board on Tuesday evening, January 15. TWIN BRIDGES—Last year, the Twin Bridges robotics team got off to a rocky start: its handful of students were teaching themselves to write computer codes, using information they learned in an eighth-grade class that gave some basic help with computer programming. TWIN BRIDGES – Before a brief holiday hiatus, area basketball teams played their last games of 2018. The Twin Bridges Falcons and Sheridan Panthers were the first to face off on Monday, December 17, and visiting Twin Bridges kept the strong start to their season rolling. SHERIDAN—Sheridan and Twin Bridges school districts are weighing a potential football cooperative agreement that would combine the turnout athletes from both schools into a single, eight-man team in coming years.